I love Louise Penny’s novels. LOVE them. I started reading them about a year ago, based on something I can’t even remember. In a very bittersweet moment, I just finished the last bit of her last one. And there won’t be another until August of next year. Heartbreaking. But at least there will be another one. It is hard exactly for me to explain why I love her books so much. It is difficult I think because there is so much to love – every story, every phrase, every joke, every tender moment is infused with so much wonderful. Saying you like Louise Penny’s novels is like saying you like music or puppies or chocolate. Why? Because, well, duh. But here is my attempt to say why I love her books, in list format of the themes and characters I love from the books. 1. The description of place and food is so appealing. I want to live in the village they are set in. And I want to make my life as much like the life of that village as I can. 2. Marriage can be both comfortable and exciting. 3. There still is lot of life and value in those who are old, fleshy, or have spilled food on their shirts. 4. Kindness is as important as, well, anything. 5. Inspector Gamache, the main character, is worship-worthy. Smart, kind, patient, strong, but still so human. 6. Lots of good book and art references. Makes me feel smart without having to do actual smart things. 7. The not-main characters are also worship-worthy. A cursing old poet, a messy artist, a psychologist book store owner, a flamboyant inn keeper. Each is easy to love and hard to forget. 8. Even those who have *really* messed up deserve love. Not only forgiveness, but love. 9. The people we work closely with can become our family. We spend so much time with them, learn so much about them, dig the ditches together – that they become etched into our lives. 10. Canada sounds like it is real purty. If you like things – people, action, love, romance, food, travel – any or all, then read these books. 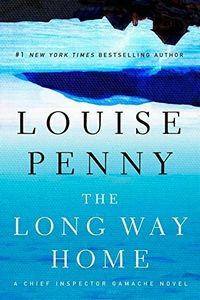 For a more cogent description of what Louise Penny’s books are all about, see here or here.